This installment of things to do this weekend June 15-17 is dedicated to dear old dad. Happy Father’s Day to all papa bears in Lake County. Continue here to learn more about 24 ways to celebrate Father’s Day. There’s no summer in Lake County without the festivals. 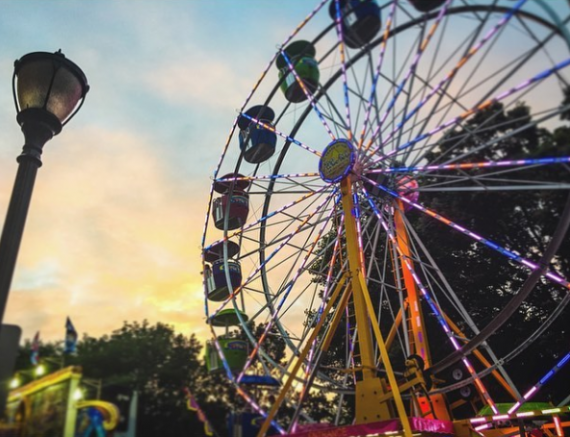 Lake County festivals are full of delectable bites, savory suds, moving tunes, fireworks shows and of course, carnival rides. This week we feature four fests in this edition of things to do this weekend June 15-17. Continue here to see the entire summer fest guide. Plan your June in Lake County as we provide you with the top 10 things to do in the halfway point of the year as well as the unofficial kickoff to the summer. Friday-Sunday, June 15-17; Fri.-Sat. : 11 a.m.-11 p.m., Sun. 1-6 p.m. Downtown Libertyville, Milwaukee Avenue and West Church Street. Are you craving some memories? Watch your past come back to life as Zion hosts Nostalgia Days at Shiloh Park. Enjoy live music, Lake County’s largest longest running car, truck and motorcycle show, outdoor movies, three live-radio broadcasts, scrumptious eats and so much more. The free outdoor movies showing at the celebration include “The LEGO Ninjago Movie” on Friday night and “Despicable Me 3” on Saturday. Both movies begin at dusk. Friday-Saturday, June 15-16; Fri.: 9:30 p.m., Sat. : 9 a.m. Downtown Zion, Sheridan Road. This newly designed Antioch Summer Arts and Crafts Faire will feature artisans from around the country. Over 140 brilliant maestros will display their unique works of art. There will also be plenty of children’s activities including face painting, balloon art and more! Is wizard chess your game or is it Quidditch? Antioch’s Wizard’s Weekend is a magical celebration running alongside the craft and arts fair. The necromancy fest provides a slew of enchanting activities including costume contests, games, a scavenger hunt and other Harry Potter-themed happenings. Wizards and muggles of all ages will enjoy this free admission event! The Antioch Chamber urges attendees to dress as the character that most closely relates to you. Some of the events hosted in the downtown Antioch festival require advance registration. Saturday-Sunday, June 16-17; Sat. : 10 a.m.-5 p.m., Sun. : 10 a.m.-4 p.m. Downtown Antioch, Main Street and Orchard Street. “Why don’t you jump out of those wet clothes and jump into a dry”…glass of wine.” Fine wine enthusiasts should visit for a two-day sip fest along the shores of Lake Michigan. The Midwest Wine Festival in Waukegan features exclusively Illinois-made wines, cheeses, breads, jams, jellies and bison meats. Explore your palate as the inaugural event features over 135 wines from 10 Land of Lincoln vinos. The city’s monthly ArtWauk is also running this weekend on Saturday as well as a Juneteenth Celebration in Bowen Park, a celebration honoring the day slavery was abolished in the U.S.
Saturday-Sunday, June 16-17; Sat. : 11a.m.-9 p.m., Sun. : 11 a.m.-6 p.m. Tickets: $20-$30. Downtown Waukegan. Gallop your way towards Tempel Lipizzans in Old Mill Creek. The majestic steeds progress through their flying horse performances and a four-horse ballet in their kickoff show to the 2018 season. Following the show, attendees will explore the rich Lipizzan history, the methods of classical riding and receive a tour of the stables. Lake County’s trustiest steeds are trotting to their 60th season. Sunday, June 17; 1 p.m. Tickets: $17-$32. Tempel Lipizzans, 17000 Wadsworth Rd., Old Mill Creek. Click here to discover all the things to do this weekend June 15-17.